The Masters was formulated in conjunction with a cosmetic laboratory to help condition and preserve your brushes with the same care and thought as products that you use on your hair. 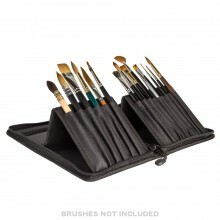 It keeps your brushes like new so they will retain the same natural snap and luster - for consistent performance - as the day you bought them. A miracle cleaner - removes paint you didn't even know was still on the brush!